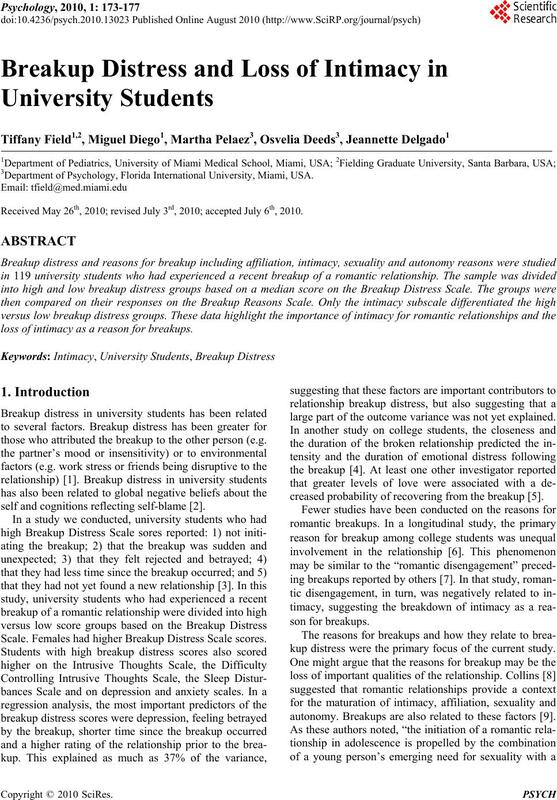 3Department of Psychology, Florida International University, Miami, USA. Received May 26th, 2010; revised July 3rd, 2010; accepted July 6th, 2010.
loss of intimacy as a reason for breakups. those who attributed the breakup to the other person (e.g. self and cognitions reflecting self-blame . Scale. 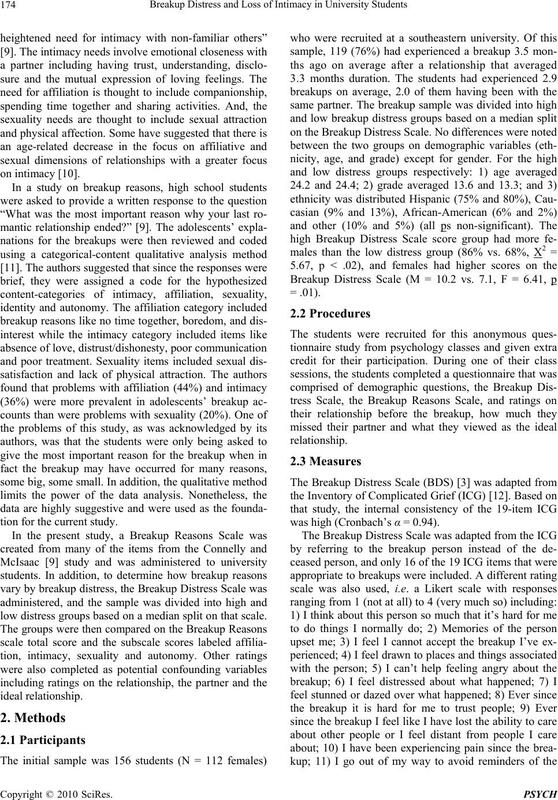 Females had higher Breakup Distress Scale scores. large part of the outcome variance was not yet explained. creased probability of recovering from the breakup . kup distress were the primary focus of the current study. autonomy. Breakups are also related to these factors . tion for the current study. low distress groups based on a median split on that scale. was high (Cro nbach’s α = 0.94). intimacy, affiliation, sexuality, autonomy and identity. Likert scale from 1 (totally disagree) to 4 (totally agree). ness. These were added for a total rating. totaled for a summary rating . Reasons Scale was also higher for the high distress group. not differ on the Ideal Relationship Rating. closure and the mutual expression of loving feelings. was given as the primary reason by 20% of their sample. and in another study . ings of ideal relationships were similar. and greater chronic stress in women . and breakup distress and their relationships to each other. led to the breakup and the breakup distress. 33101. Business phone number (305) 243-6781. Vol. 10, No. 1, 2003, pp. 113-128. Break-Ups,” Stress and Health, Vol. 25, No. 1, 2009, pp. Vol. 44, No. 176, 2009, pp. 705-727. Psychology, Vol. 53, No. 4, 1987, pp. 683-692.
and Social Psychology Bulletin, Vol. 32, No. 3, 2006, pp. sues, Vol. 32, No. 1, 1976, pp. 147-168.
cence,” Journal of Research on Adolescence, Vol. 13, No. tive,” Journal of Adolescence, Vol. 32, No. 5, 2009, pp. sand Oaks, Vol. 47, 1998, pp. 1-200. H. G. Prigerson, P. K. Maciejewski, C. F. Reynolds III, A.
Vol. 59, No. 1-2, 1995, pp. 65-79.
sity Press, Cambridge, 1999, pp. 125-147. 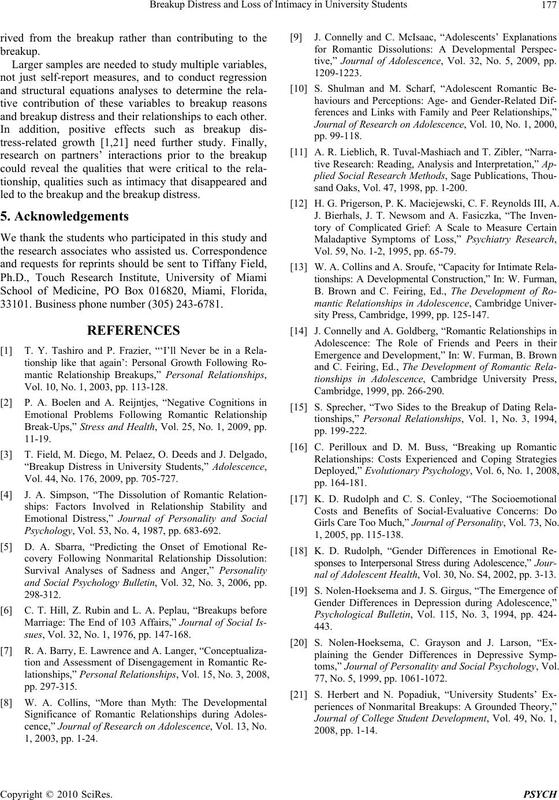 Girls Care Too Much,” Journal of Personality, Vol. 73, No. nal of Adolescent Health, Vol. 30, No. S4, 2002, pp. 3-13.
toms,” Journal of Personality and Social Psychology, Vol. 77, No. 5, 1999, pp. 1061-1072.